Batman: Nightwalker, I've heard lots of versions of Batman but I am still looking forward to every story that comes out. To be honest, I enjoyed this book, there were some slow parts on the first few pages of the book but when I got the one I wanted I just can't stop reading. I end up finishing it at 3am in the morning LOL. I'd love to know what will happen to Bruce and Madeleine. I'd love to know who's Madeleine. What made me read this slow on the few pages was, I am really hoping for more action but then I realized he's still Bruce Wayne here. He's just a newly graduated student, that was totally understandable. I enjoyed the part when he started to dig more about Madeleine. His curiosity is very Batman way. I loved how the author wrote about Bruce Wayne, it feels like watching a tv show or a movie because this reminds me of "Gotham" tv show. 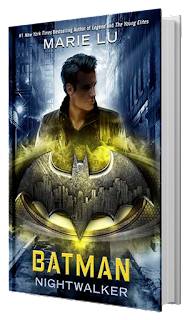 The book was carefully written and it was different from the usual Batman story. I liked how the author described Bruce Wayne here. And to be honest I am hoping there will be another Batman story like this one. I'd love to know how Bruce Wayne will turn in to the real Batman. I am really looking for more books like this. I haven't read the other DC Icons book but I am pretty sure I will start reading them now. I really had a hard time to put this book down when I was reading it the other night. I almost forgot to have my dinner LOL. I enjoyed reading it. I'd love to recommend this book to other readers, I'm sure they will enjoy this as well. Bruce Wayne and Madeleine Wallace? I am rooting for those two. I am looking forward for more stories about them. Hope there will be someday.